You wouldn't put any old oil in your engine, so why would you put it in your compressor? 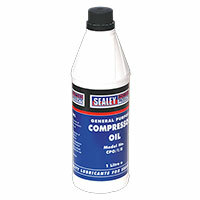 Make sure you have the right lubricant for the job with our range of compressor oils. There are many different types of oils used as lubricant, all of which have different operating temperatures and different viscosities - how 'liquid' they are. It's important to have the right lubricant for the right purpose; not doing so could mean not only impairing the performance of the equipment but possibly even permanently damaging it. We have a range of oils suitable for use in a compressor, ensuring that things run smoothly, that heat is removed from the system in the right way and that parts are appropriately cooled. You'll find top-line brands stocked, all at the great prices you expect from Euro Car Parts. What's more, all our products come with free UK delivery, and options to click and collect from any of more than 200 stores nationwide. If you need the item in a hurry, we may even be able to offer a next-day service. If you're buying from overseas, you'll find a range of international delivery options.